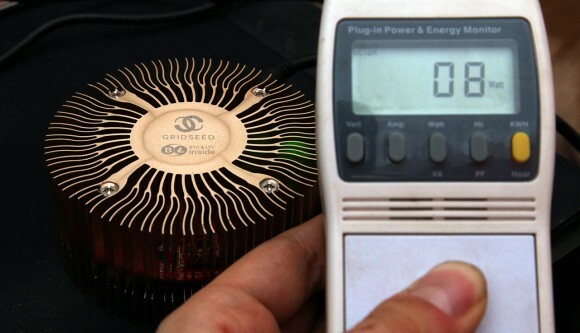 It seems that the community has figured out a way to do a voltage mod for the Gridseed 5-chip ASICs that allows for higher overclock frequencies and thus even higher hashrate. We have decided to try out the mod ourselves and report our own findings and results with our older and newer dual mining mode ASIC devices from Gridseed. 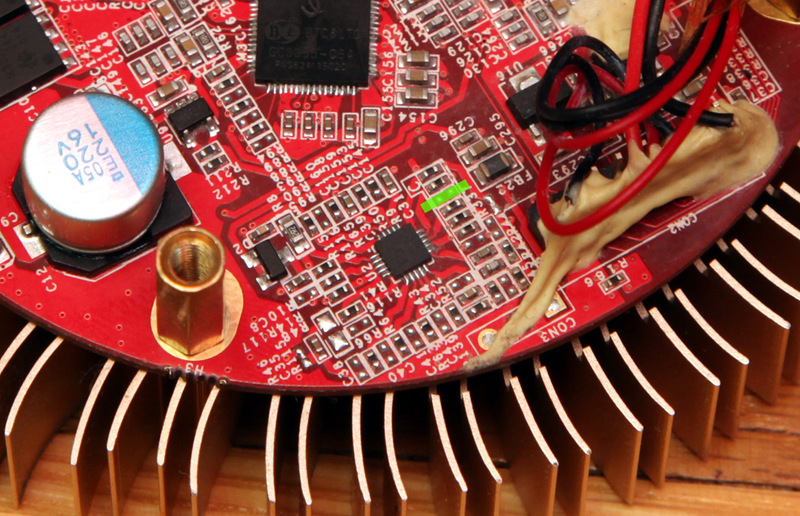 What you need to do in terms of hardware modification to your miner is to solder a bridge on the place marked with the green line on the photo above. 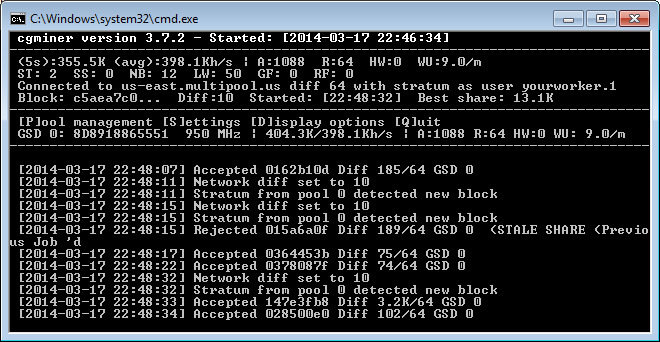 Then you need to run the latest version of the modified cgminer for Gridseed with an extra option for the gridseed options line “voltage=1”. Note that the space where you need to solder a bridge is very small, it is designed for SMD resistors and if you are not experienced with a soldering iron you will have trouble performing this modification by yourself. Also if you are not very careful you may damage the device by soldering something that should not be soldered and thus shorting the ASIC, so be very careful should you decide to mod the device or higher voltage! After performing the hardware modification to our two miners that are from different revisions apparently we have tried running them with the modified cgminer (download link for the windows binary below, for the source). The older revision of the device we’ve got with CP2102 USB to UART Bridge Controller trying to run the setting to set the higher voltage from within cgminer returns an error about the firmware not supported. The device has a firmware version 01140116 and apparently this version is not supported, even modifying the cgminer to recognize it as supported firmware did not help in being able to overvolt and overclock the miner. The other newer ASIC device with STM32 Virtual COM port driver was with the correct firmware version 01140113 and the miner apparently did activate the overclock and overvolt mode. The power consumption of the device we have measure with the voltmod and running at 950 MHz frequency was with about 2W higher than at 850 without the voltmod, or with other words 8W instead of 6W (in fanless mode) with 2W more with the fan working (10W and 8W respectively). If you are doing the voltmod however we would not recommend to use the device in passive fanless cooling mode, though at 850 MHz and with no voltmod we have been running a single miner for already 48 hours without any issues. With the increased voltage of the Gridchip GC3355 processors we were able to get from 850 MHz with no or very few HW errors (361 KHS) to 950 MHz with no to very little HW errors (404 KHS) after the modification. We could also go to about 425 KHS at 1000 MHz with very few HW errors, going up to 1050 MHz produces almost 450 KHS, however the number of HW errors we are getting at that frequency is significant, so the real performance is probably much lower than at lower clock speeds. What we would recommend as the most stable result is to go to 950 MHz as overclock frequency as good starting point after doing the voltmod and go up in 50 MHz steps to see how will your miners perform at higher frequencies and if they will do any better results. The latest version of cgminer supports overclock up to 1300 MHz in 50 MHz steps, so you can go pretty high, though you should be careful as the increased voltage and frequency might lead to damage of the device. We have compiled an updated version of the cgminer 3.7.2 for Gridseed 5-chip ASIC devices with some small fixes and have an option to try and overclock the device over the previously available maximum limit of 1000 MHz. Now you can try running the device at 1050, 1100, 1150, 1200, 1250 and 1300 MHz, though these in our experience going past 950 MHz will most likely produce only hardware errors, you are still welcome to try. So far 850 MHz operating frequency for Scrypt only mining mode seems to produce the best results with most devices, though you are welcome to experiment with yours. 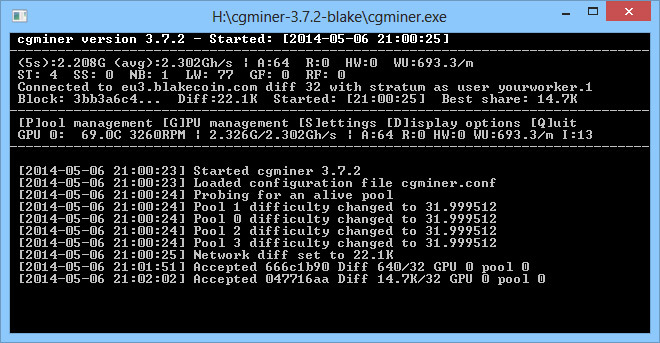 For a guide on how to install and use the Gridseed 5-chip ASICS with this cgminer. 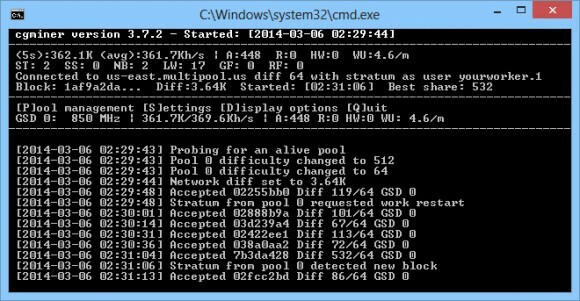 Also note that cgminer 3.7.2 for Gridseed does require you to replace the standard virtual USB to COM driver with WinUSB driver with the help of the software Zadig in order for cgminer to be able to detect and use the GSD ASIC devices.